You do what you can with what you've got. 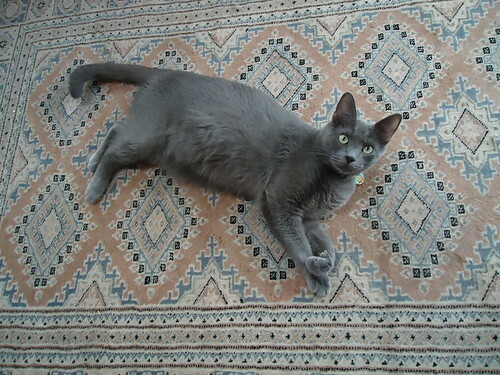 Timmy Kitaen, rug model, originally uploaded by chris_wass. feathered fedora, originally uploaded by chris_wass. In my search for a cute head covering to wear to my cousin’s Bar Mitzvah, I came up with two bases to make some little felted fascinator hats from. I posted free patterns over at the PHUCS blog. 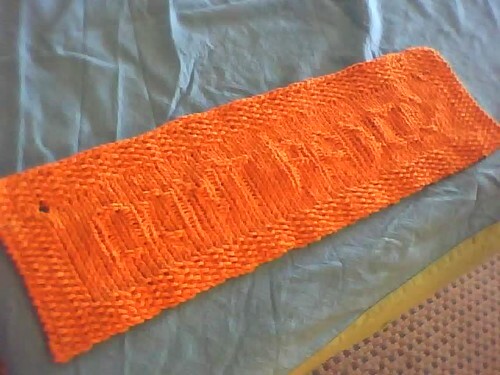 I've also added it to Ravelry. 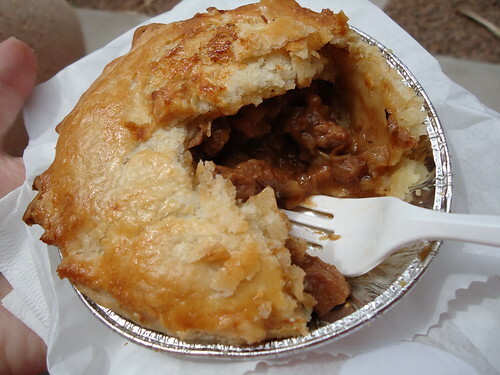 The Best Pies in Scottsdale, originally uploaded by chris_wass. If you ever consider going to the farm market in old town Scottsdale on Saturday, get one of these delicious pies from Saffron Kitchen! She makes them with a lot of local ingredients, and has beef, chicken, and vegetarian versions. Sign of the Devil? No, just Comic-Con. 666, the number of views on my Flickr photos yesterday. Most of the time, my stats are in the 200-300 range, unless something related to what I've photographed hits the news. Even though I didn't go to Comic-Con this year, I still saw a spike in views. Consistently popular are these two photos, one of the tattooed back of an ever-beloved Slave Leia, and more surprising, one of two guys that look like Metalocalypse's Skwisgaar and Toki. The "Greetings, programs!" 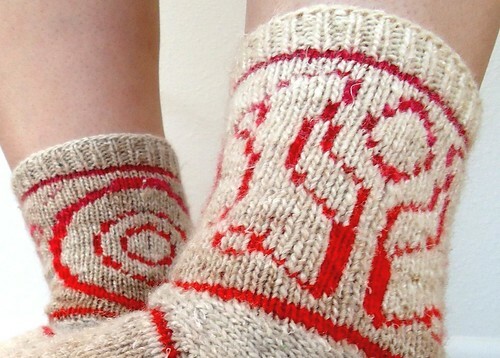 socks showed up on Craftzine's weekly Flickr pool feature! Greetings, programs!, originally uploaded by chris_wass. Like many knitters, I've been eagerly clicking away on Knitty's web site for a glimpse at the new patterns. While I was reading through Kathleen Sperling's new Celtic Triad socks, a saw a little shout-out, to ME! WOW, how cool! It turns out that she liked the little modification that I did to her Hat Heel sock that she incorporated the changes into her new pattern. I am filled with knitterly pride! 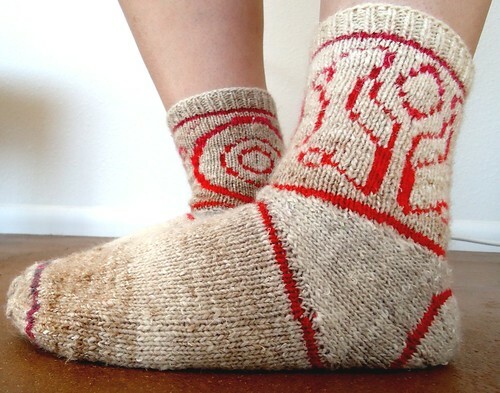 In my own knitting news, I'm finally finishing up the pattern for the TRON inspired socks that I've been working on. I started with a small chart for 56 stitch socks, and have created two more variants for 60 and 74 total stitches for medium and large socks. I finally finished knitting up the large socks in TRON-like dove gray and cyan, and got my friend Myrna to model them for me this morning. Pics will be uploaded this weekend! They are slated to be a gift for my big bro, whose TRON fandom and enthusiasm over the upcoming release of TRON Legacy inspired the sock design. This summer, I've been working to finish off the projects that I started for classes that I taught last winter and in the spring, and a gift for a friend's baby. These include a fair isle sweater dress, yellow lace socks, sporty pastel anklets, a "Don't Panic" towel, a giraffe toy, and a giraffe quilt block. If you want to check those out, peruse my Crafty photo set on Flickr. Running Ghost, originally uploaded by chris_wass. 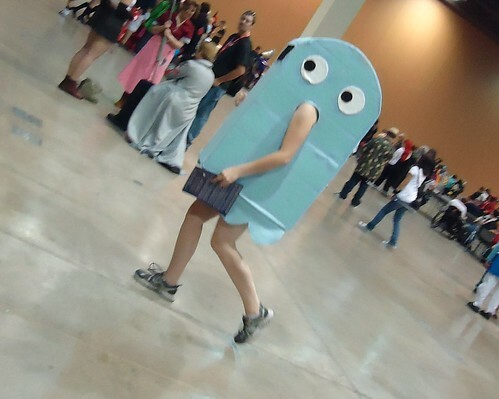 I went to the Phoenix Comicon last weekend held at the convention center in downtown Phoenix. While it was considerably larger and the meeting rooms nicer than the previous events held at the Mesa convention center, it is still a fraction of the size of San Diego. I guess that I shouldn't compare it to San Diego, that it's really not fair, but it's hard not to. Only attended on Saturday, there weren't compelling enough panels on Sunday, and the vending area was easy to cover on Saturday before/between panels. I was happy to get to see Wil Wheaton again with the adorable Felicia Day, and a short performance by Peachcake which I enjoyed (though I think that I'm their oldest fan). I volunteered at the registration table on Thursday night. It was even less organized than I expected. I hope that the long-term staff and dedicated volunteers for this event learned a lot, because they really seemed at a loss to handle the new venue. Things ran smoothly overall, I think, but there was quite a bit of hap-haphazardness. I jacked up my neck from the 4.5 hours of standing and looking down at a hip-height table to check people in and hand out badges. Stupid disk bulge at C6 from the accident in December. It has taken almost a week to recover. As much as I think that my organizational skills, positive attitude, and authoritative abilities were an asset to the registration team, I'll find a different function to volunteer for at the next Con. Don't Panic on Towel Day! Don't Panic on Towel Day!, originally uploaded by chris_wass. SARC Socks, originally uploaded by chris_wass. 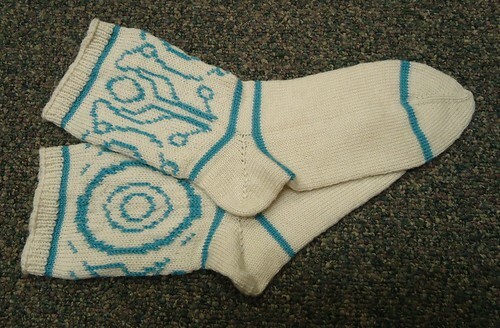 These TRON inspired socks that I recently finished knitting got a shout out on Craftzine's weekly roundup post. Sweet.